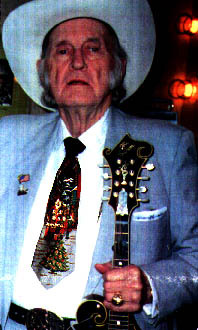 Backstage at the Grand Ole Opry, or wherever he happened to be at Christmas time, Bill Monroe was Father Christmas. Bill never sang any lyrics he couldn't believe in, and when he sang, "I always have loved Christmas, it's my favorite time of year," you knew it was absolutely true. When I first met Bill it was in the springtime (of 1963), but through his recordings and shows, especially a live tape that made the collectors' rounds of a 1955 Christmas show at Town Hall Party in Los Angeles with Charlie and Bill Monroe and a stellar cast of Blue Grass Boys, I associated Bill with the Christmas holidays before even meeting him. Well into the 1960s it was traditional for Bill and the band to plan their West Coast tour for the wintertime. In those pre-festival times it wasn't unheard-of for club bookings on the folk circuit to run into days and even weeks, and for a number of years the whole entourage would camp out at the Ash Grove, the well-known folk club in Los Angeles, at Christmas time for a two-week engagement. On one occasion, Christmas of 1963, the extended booking even saw a personnel change in the band: Bill Keith's banjo position was replaced by Bobby Diamond, who was flown in from the Washington, D.C., area. That Ash Grove Christmas was memorable for me and some bluegrass friends (Bay Area pickers then living in L. A. and trying to "make it" with their band) because it was the first chance we'd had to spend any personal time with Bill. I didn't know how accessible he'd be at the club, but I wasn't going to let anything, not the 400-mile driving trip or snowstorms over the Grapevine, deter me from going down to see him. If we expected a brief audience with the master, what we got was as warm a welcome as if we'd been to see him at the Opry. Part of the reason for that must have been the relationship between him and Ash Grove founder Ed Pearl, certainly the most significant bluegrass advocate in California during the Sixties. Pearl even cut us northern pilgrims a deal, letting us in to see the shows at reduced rates. When funds ran out, we went anyway, content to hang around the front entrance and hear what we could from there. Pearl's private office had become a kind of receiving area for Bill and the Boys. One night I knocked on the office door and went in with Butch Waller, who had brought along his newly-acquired Gibson mandolin, a woody-sounding 1923 F-5 just a few serial numbers away from Bill's. I don't recall what part of the evening this was-whether it was between shows or beforehand-but Bill got his mandolin out and sat with Butch for what seemed like hours, painstakingly showing him how to play "Raw Hide." The image of Bill Monroe with his supreme patience, never one to "get in a hurry" no matter the circumstances, passing along his mandolin brilliance to an eager young student is a dear one that I cherish always. Now that I think of it, I doubt there could be a much deeper expression of the generous spirit that is at the heart of Christmas. As always with Bill, there was seriousness and there was fun. Not too many winters ago I visited his dressing room at the Grand Ole Opry and listened as the band rehearsed "That's Christmas To Me," Bill's holiday song of the late Seventies whose lyrics were quoted above. At one point he brought the proceedings to a halt while the banjo was playing some fancy Earl Scruggs-like backup licks instead of the simple, bell-like chimes that Bill Holden had picked on the original 1977 recording. He told the young banjo player, "You've got to get that Christmas banjo tone." This broke everyone up, although the room was silent. We didn't know if "Christmas banjo tone" meant those expected harmonics, or whether it just meant some kind of sparkling tone that pleased Bill's ear on a holiday number. Whatever it was, Bill wasn't hearing it, and he wanted it. It was, after all, Christmas. Things had to be especially right. I feel fortunate and grateful to have shared a few holiday times with Bill over four decades, but my two most treasured close encounters with "Father Christmas" came during what were unfortunately among his last Christmases on earth, in the early '90s in Nashville. The first of these was Christmas of 1992. Bill's guitarist and lead singer, Tom Ewing, was taking some time off for the holidays and asked me if I'd like to fly out and fill in for him on the Opry. Tom even left me his guitar and hat in his Opry locker for this dream come true. On Christmas Eve we played the Friday Night Opry. On Saturday it was cold, for Nashville. 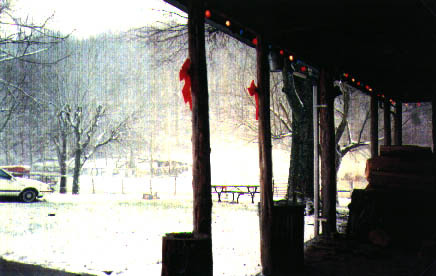 I'd been invited out to Bill's farm for early Christmas dinner with family and friends, the first Christmas I'd shared with the Bluegrass Father in years and the first one ever at his own home. This was especially important to me because, as a kid raised in a Jewish home without Christmas, Bill's evocative 1951 recording, "Christmas Time's A-Coming," and his love of the holiday helped it come alive for me. 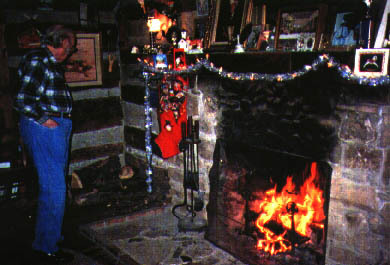 Inside Bill's 200-year-old log house there was a lot of warmth and conviviality, smoke curling up the old stone chimney to the crisp air outside. Bill was standing there quietly tending the fire in the rustic living room. 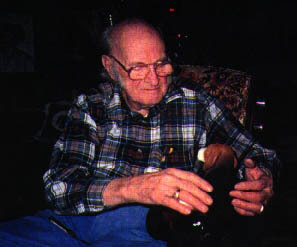 He would go out to the porch for logs occasionally while dogs, kitties, and kids scampered around him like something from the verses of an unwritten bluegrass song. Later, after dinner, he sat in his easy chair, circled by son and grandson and all the gathered friends, and it was time to watch him open his presents (and give some, too: I got a wallet and key ring set that served several years from that day onward). While all this joy was happening, we barely noticed that it had become very, very quiet outside, and very, very gray. A few more presents-an unforgettable look of delight filling the flame-illuminated hollows of that famous Monroe face as he unwrapped a lifelike model of a cute little puppy dog-and suddenly we realize it's snowing, and not just a little. We stepped out on the porch to watch in wonder and hear the soundlessness of the best White Christmas ever, then quickly back inside to Bill's carefully tended fire. It was still just early afternoon, but with his years of road experience, it took Bill no time at all to make the decision that we needed to get dressed and ready and get into town and to the Opry while we still could. He was worried that we'd be late for the Christmas show. The snow was falling so fast and furiously that staying the night at Opryland wasn't ruled out, so we packed up the long white limousine, which was quickly becoming invisible under the snowy blanket outside. Bill was right. It turned out that we didn't have to stay in Nashville overnight, but the roads out from the farm were treacherous. Our bluegrass caravan snaked along the country lanes, carrying Mr. Monroe and his entourage to town. He was in the front passenger seat, hat on as usual. At one point, after he seemed comfortable with the way his driver was handling the car, that snow-white hat began to turn towards me, and I leaned forward from the back seat. I thought he was going to say something about the weather or the roads or tonight's show. Instead, taking a break from his vigilance about driving safely and getting to the Opry on time, he calmly pointed to a corner house we were just passing and told me wistfully, "That's where Bradley Kincaid used to live." We were at the Opry hours early. Hardly anyone was around backstage. We unpacked the mandolin and guitar and played and sang, and had coffee, and talked, and were quiet for long periods of time, like you always were with Bill. One by one the rest of the Blue Grass Boys arrived, Bill telling each of them "Merry Christmas!" as if they were visiting dignitaries instead of the hired musicians he saw almost every day. We didn't decide what songs we were going to do-an instrumental, the traditional gospel quartet, a Monroe chestnut or two-until shortly before going on. That was the system. A year later I had the same chance on a different instrument. Bill's banjo player, Dana Cupp, was going home for Christmas and offered me the holiday weekend at the Opry. This time it didn't snow. Things were different out at the farm, too-the Christmas party this year was smaller. On Thursday evening Bill asked if I could drive us to church in the limo. I'd only driven it once before, when he'd suddenly appointed me driver at Bean Blossom. When we got there the minister asked us if we would sing a couple of songs from the pulpit. Bill and I looked at each other and we told him we didn't even have a guitar between us, just our mandolin and banjo in the trunk. It never occurred to me that we would stand up in front of the congregation and sing and play just with those two instruments, but that's exactly what we did. It was sublime. Of all the times I was honored to play music with Bill Monroe, this occasion promised to be among the more perilous-but it was the best. Perhaps, without distraction from the other instruments or voices, it was easy for Bill to hear well and be musically responsive. Perhaps the same was true for me. Perhaps, with only the two fine old Gibson instruments (his 1923 mandolin, my banjo from the '30s) ringing together, it was possible to experience a blending of tones you couldn't easily distinguish within the competing sounds of a full band. "Separate your notes, keep your timing right, and let your tones come out," Bill was once quoted; he always set his notes like a fine craftsman setting gemstones into silver. This night again I was struck by how his instrumental and vocal articulation bespoke an intense drive to deliver the music with unwavering clarity. As my stage fright receded in front of that small and earnest Tennessee congregation, I heard the two instruments talking to each other in a way I never had beforeand never would again. I had the impression that Bill's listening ability and his musical responsiveness, phenomenal in the best of times, were at a powerful attunement. Every note I played he complemented on several levels at once, supporting a seamless musical conversation: choice of notes, register and voicing, tonal color. He relaxed and settled into the duet format the way I remember him settling into the circumstances when we played stage shows without any microphones back in 1964. He just made it work-the Master Bluegrass Builder tightrope-walking on the architecture of sound, his whole being, body and soul, serving as the net. The next evening we played the Opry. He surprised me by publicly complimenting my banjo tone. It was the first time I had ever played five-string banjo in that historic place. Moving away from center stage as the curtain went down after one of the many short sets you do at the Opry, Bill walked next to me, his eyes twinkling in the dark as he asked in his best Good Uncle voice: "Did you enjoy that?" I said I sure did, and also told him what I felt from the playing we'd done at the church. He said yes, the two instruments had really sounded good together there. And now it's time to tell the anecdote that began this story. The time I heard him called "Father Christmas" backstage at the Opry was this same night, Christmas weekend of 1993. The person who called him that was Porter Wagoner, and then it was echoed by Wilma Lee Cooper, Bill's old friend who shared a dressing room with him for so many years at Opryland. Here's how it happened. James Monroe came into the dressing room with a Christmas present for his Daddy. 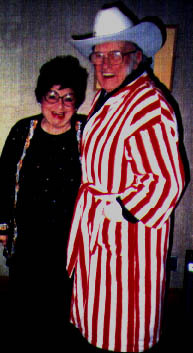 Bill opened the large box to find a cotton terry-cloth robe in a candy-cane design: wide red stripes against a white background, reminiscent of Old Glory. Bill was delighted with it-Christmas candy and American patriotism all at the same time-and immediately put it on over his dark suit! He looked at himself in the mirror, smoothed out the robe and his tie under it, and went striding out to the backstage hallway. He would spot someone he knew and walk right up to them and stand really close (uncharacteristically close), ask if they liked his "coat," and just grin. At one point he was doing this to Gwen McReynolds, Jesse's daughter: "How do you like my coat?" Tom Ewing, who was standing next to her against the wall of musicians' lockers, remarked, "That's a nice bathrobe, Bill!" Bill drew himself up to his full height, looked Tom square in the face, and said in utter seriousness, "You wouldn't take a bath in something like that!" Then he turned around and walked into the coffee room, straight into Chet Atkins, who was randomly filming with his camcorder. 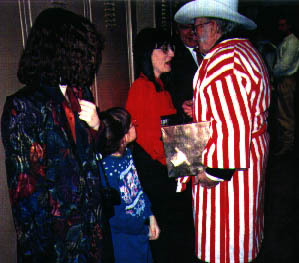 At one point Bill even went onto the live Opry stage as an act was performing, strode right out to the spotlight, and showed himself and his new overcoat to the audience. Impishly, he stayed dressed that way for the next Blue Grass Boys segment. He seemed to love playing in it. That's when Porter called him Father Christmas. When he came back to his dressing room, thoroughly delighted and pleased with himself, Wilma Lee helped him take the "coat" off and hang it up, and then everyone spent the rest of the night picking a thousand little red and white threads from his dark blue suit. After we had rehearsed and played the rest of our segments, he put his "coat" back on again and showed it off to some new people who were milling around backstage. Finally we helped him pack up the coat and all of his other Christmas presents and take them out to the car. We'll never know for sure if he did or didn't know what a bathrobe was. Knowing Bill, equal parts rough-hewn 19th century pioneer and urbane leg-puller, it could have been just as likely either way. He was 82 then. That was the last Christmas I got to spend with him. This is the first Christmas without him. White candles are burning, as he sang in "Christmas Time's A-Coming," but they're not as warm as they used to be. William Smith Monroe was Christmas, just as he was bluegrass, and neither of them will ever be the same again.